New Orleans Hostel - Marquette House i New Orleans, USA : Boka nu! 'The Original New Orleans Hostel.' From $20 and up, jazz it up New Orleans style at the best hostel in the City. Marquette House is the ideal location for individuals & groups to explore one of the most fascinating cites in America. Special rates and separate facilities, including group dorms and group kitchen/dining areas, are available for groups. Free parking is available for vehicles and vans. Free WiFi in our lobby and garden-patio areas. Want to see Mardi Gras and New Orleans without all the huge crowds, we have good availability for both dorm beds and our private rooms with bath for the early Mardi Gras days of Feb. 22-28, 2019, and also for the peak long Mardi Gras weekend of March 1-5, 2019. We are located just one block off the primary Mardi Gras parade route, where many of the most famous Mardi Gras parades pass. For the peak long Mardi Gras weekend of March 1-5, 2019, please contact the hostel direct regarding the availability of private rooms, and for group accommodations. Our hostel is also a great location for attending the New Orleans Jazz Festival, as a city bus only one block away takes guests to the Jazz Festival area for only $1.25. The New Orleans Jazz Festival is April 26-28 and May 2-5, 2019). Located in the 'heart and soul' of the 'new' New Orleans, experience the 'real' New Orleans with its cafes, 24 hour bars, coffee houses, and great music just outside our doors. We are not a party hostel, but can tell you where the parties are. We are a well managed hostel that has been in business for 38 years. The Owner/Manager is a native of New Orleans and a former backpacker/world traveller. Only Visa or Mastercard credit and debit cards are accepted for internet reservations. Please note that group bookings for more than 6 persons are not accepted on this site, and multiple bookings exceeding 6 persons made by the same party will be treated as a group booking and will not be accepted. The maximum number of guests for one party that will be accepted is 6. For groups larger than 6 persons, please contact us direct for information and reservations. No curfew, and 24 hour access to your dormitory or private room is provided upon check in. We do have limited check in hours of 8am to 12noon and 5pm to 8pm, which enable us to keep our costs and prices low. Check outs earlier than 8am may be arranged with the hostel office the evening before. Late night check ins for guests needing it and after hours check ins for groups can be normally be arranged. If you are delayed or will arrive later than 8pm, telephone the hostel office during office hours to arrange a late night check in. These can generally be arranged for arrivals up until 2am. Extended check in hours are often available during special holidays and special events like New Years, Mardi Gras, Jazz Fest, and Voodoo Fest. Please email us or contact our office during our normal office hours for the latest information. With one of the best locations in the City, we are only minutes away by streetcar, bus, taxi, or Uber from downtown and the lively French Quarter. We are one of the closest hostels to the Greyhound, Megabus, & Amtrak Stations. 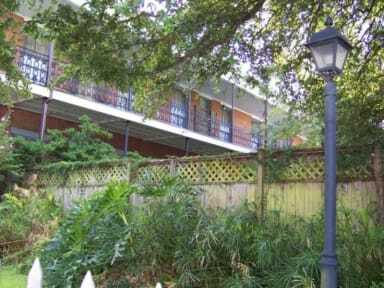 Many banks, hotels, cafes, coffee houses, pizzerias, fast food restaurants, 24 hour bar/pubs, neighborhood groceries, a 24 hour drugstore, the New Orleans Visitors Center, and the second oldest New Orleans 'City of the Dead' are within easy walking distance. Explore the nearby Garden District with its antebellum mansions & gardens, above ground cemetery, and century old oak trees. Be sure to book in advance for the VooDoo Fest (Oct. 27-29, 2017), Halloween (Oct. 31, 2017), New Year's holidays (Dec. 29, 2017-Jan. 1, 2018), Mardi Gras (Feb. 22-March 5, 2019), Jazz Fest (April 26-28 and May 2-May 5, 2019). Contact the hostel direct for reservations if no availability is listed. Private rooms for the peak Mardi Gras weekend (March 1-5, 2019) and Jazz Fest weekends (April 26-28 & May 2-May 5, 2019) must be booked direct with the hostel. 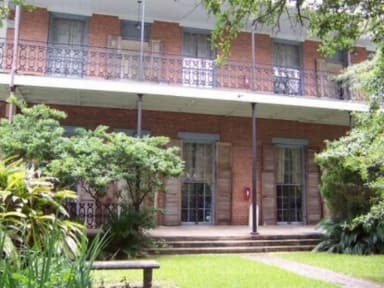 Marquette House is located in a village like complex of New Orleans style buildings. We offer comfortable spacious male and female multi-roomed dormitory style accommodations. Each dormitory has its own ensuite toilet(s), shower(s), and 2-3 lavatory sinks. Dorms generally have 8 or 14 beds. Our larger 14 bed male or female dorms are large comfortable multi-roomed dorms with ensuite baths. We also offer private rooms with ensuite bath for 1, 2, 3, 4, 5, 6 or more persons with linens & towels included. Our large spacious private rooms are some of the nicest to be found at any hostel. Each private room has a private bath, queen size bed, and/or day beds and bunk beds as needed, a kitchen sink unit, refrigerator, microwave, toaster, coffee maker, sitting area, and a table with chairs. Dishes & utensils are also available for these rooms. Reservations for private rooms and dorms for 7 or more persons should contact the hostel direct. Exchange experiences with fellow travelers from all over the world in our tree shaded patios and gardens. Join other guests at nearby cafes, restaurants, and night clubs until the early hours or prepare a meal in the outdoor BBQ area. Experience the uniqueness of doing your laundry while you sip a beer or play pool at the nearby Igors 24 hour lounge and laundromat. Weekly and monthly dormitory and private room rates are also available. A $10 refundable cash key deposit is required upon arrival. An ATM is located at a bank just one block away.